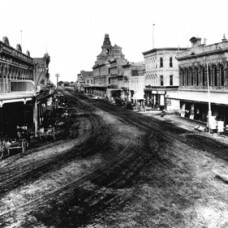 Los Angeles was a rough-and-tumble frontier town in the early 1870s, when a group of public-spirited citizens led by Judge Robert Maclay Widney first dreamed of establishing a university in the region. 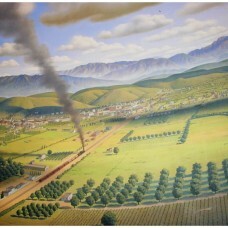 It took nearly a decade for this vision to become a reality, but in 1879 Widney formed a board of trustees and secured a donation of 308 lots of land from three prominent members of the community – Ozro W. Childs, a Protestant horticulturist; former California governor John G. Downey, an Irish-Catholic pharmacist and businessman; and Isaias W. Hellman, a German-Jewish banker and philanthropist. The gift provided land for a campus as well as a source of endowment, the seeds of financial support for the nascent institution. 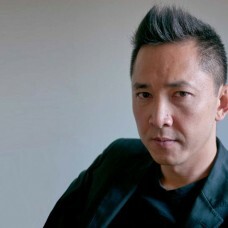 2017: USC Dana and David Dornsife College of Letters, Arts and Sciences professor Viet Thanh Nguyen receives a MacArthur Foundation Fellowship. 2017: USC researchers provide key analysis of the data gathered annually by the county and city of Los Angeles, as part of the university’s Initiative to Eliminate Homelessness. 2017: An independent economic impact study on USC showed that the university is one of California’s strongest economic engines. The study found that USC spurs $8 billion annually in economic activity in the Los Angeles region and California. 2017: The Campaign for USC reached its $6 billion goal 18 months earlier than anticipated, securing its place among the most successful campaigns in higher education. The university extends its fundraising through 2021 to support high ambitions and access for students. 2016: USC alumni Oscar De Los Santos '15 and Jung Kian Ng B.S., M.S. ME ’14 were among 32 Americans who were awarded a prestigious Rhodes Scholarship to the University of Oxford. 2016: USC Annenberg School for Communication and Journalism professor Josh Kun receives a MacArthur Foundation Fellowship. 2016: USC's Neighborhood Academic Initiative celebrates 25 years of preparing low-income neighborhood students for admission to a college or university. 2016: For the first time ever, women outnumbered men in USC's graduate video game design program - ranked #1 by Princeton Review for game design. 2015: Professor Dana Gioia was named California Poet Laureate by Governor Jerry Brown. 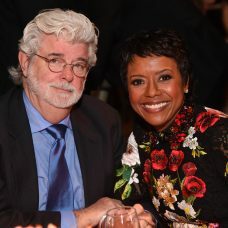 2015: The George Lucas Family Foundation endows the recruitment of USC Cinematic Arts students from communities underrepresented in the entertainment industry. 2015: A gift from Rick Caruso founds the USC Tina and Rick Caruso Department of Otolaryngology – Head and Neck Surgery to support advanced research for the field. 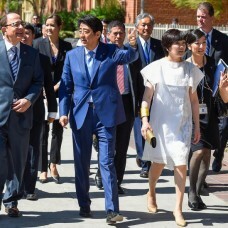 2015: In partnership with Los Angeles policymakers and educational institutions, USC lays out the strategic groundwork for the region's biotechnology corridor. 2014: A gift from Ronnie Chan founds the USC Mrs. T.H. Chan Division of Occupational Science and Occupational Therapy, the first naming gift ever made in the field. 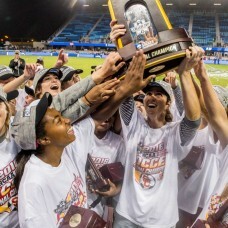 2014: The USC Men's Tennis team won the university's 100th national championship. 2013: The FDA approved the Argus II retinal prosthesis system, developed by University professor Mark Humayun and his team. 2013: Keck Medicine physicians become the first to implant the FDA-approved epilepsy-controlling device, the NeuroPace RNS. 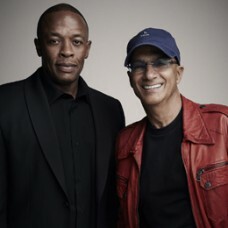 2013: Campaign for USC reaches a milestone, raising $3 billion in a record-breaking 3 years. 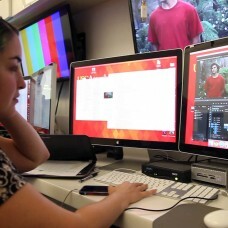 2013: USC School of Cinematic Arts opens the new Interactive Media Building, showcasing video game design, transmedia, and world building projects. 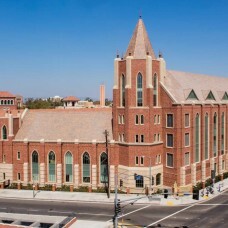 2012: In 2012, the university added its sixth arts school—The USC Glorya Kaufman School of Dance. 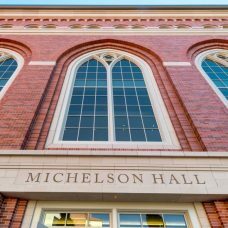 2011: The School of Policy, Planning, and Development is renamed the USC Sol Price School of Public Policy with a $50 million gift from the Price Family Charitable Fund. 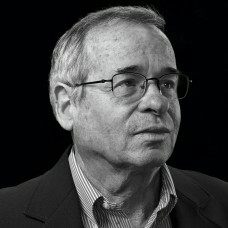 W. M. Keck Foundation, USC's academic medical enterprise is named Keck Medicine of USC. 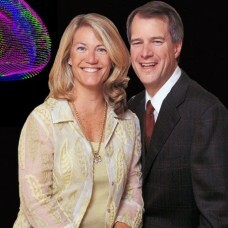 2011: USC receives $110 million from Julie and John Mork to create the Mork Family Scholars Program — USC’s largest single gift ever for undergraduate scholarships. 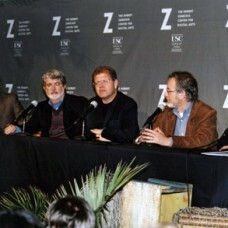 2011: The country’s largest public literary festival, the Los Angeles Times Festival of Books, finds a new home on USC’s University Park Campus. 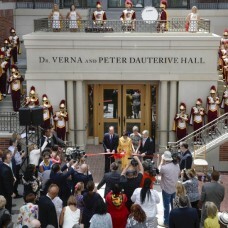 2011: USC receives $200 million -- the largest single gift in its history -- from Dana and David Dornsife. 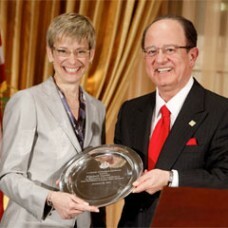 2011: Elizabeth Garrett is installed as USC's first female provost. 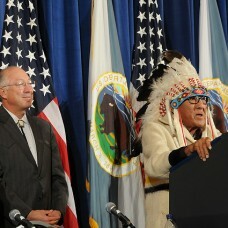 2011: University Professor and historian Kevin Starr is inducted into the California Hall of Fame. 2010: USC becomes the first academic institution in the world to be designated an International Safe Community by the World Health Organization. 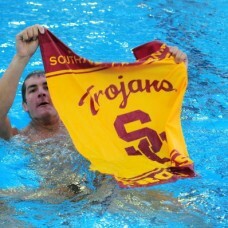 2010: U.S. News & World Report ranks USC no. 23 in the United States. 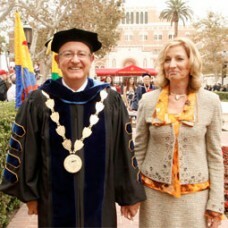 2010: C. L. Max Nikias becomes the 11th president of USC. 2010: The Institute of International Education’s annual Open Doors report names USC the country’s leader in international student enrollment for the ninth year in a row. 2010: USC opens its sixth international office (and fifth in Asia) in Seoul, South Korea. 2001: USC’s Robert Zemeckis Center for Digital Arts opens as the country’s first and only fully digital filmmaking training facility. 2001: USC sponsors its first international conference, convened in Hong Kong. 2002: At the close of the “Building on Excellence” campaign, USC has raised $2.85 billion in nine years, a record in higher education fundraising. 2003: The U.S. Department of Homeland Security selects USC as its first Homeland Security Center of Excellence. 2004: The Los Angeles City Council dubs January 21 “USC Trojans’ Day in L.A.” to honor the university’s 2003 football, women’s volleyball, and men’s water polo teams. 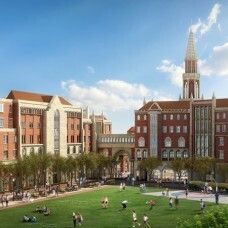 2004: The Board of Trustees approves the university’s new strategic plan: “USC’s Plan for Increasing Academic Excellence." 2005: The Princeton Review selects USC as one of 81 “Colleges with a Conscience” based on its outstanding record of community involvement. 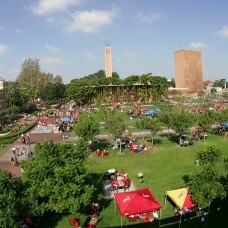 2006: An analysis by Economics Research Associates reports that USC is responsible for $4 billion annually in economic activity in Los Angeles County alone. 2006: USC University Professor Kevin Starr is awarded the 2006 National Humanities Medal. 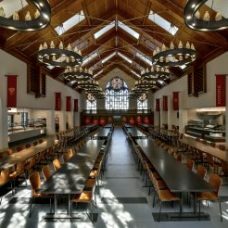 2007: The USC Levan Institute for Humanities and Ethics is created, engaging students with the humanities and a particular focus on ethics and values. 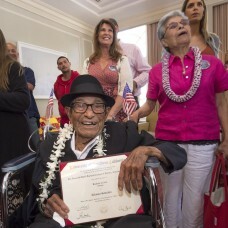 2007: The USC Edward R. Roybal Institute for Applied Gerontology is established. 2007: USC inaugurates the Discovery Scholars and Global Scholars programs to recognize undergraduates who demonstrate original scholarship and creativity. 2007: USC professor of composition Morten Lauridsen receives the National Medal of Arts. 2008: The White House awards the 2007 National Medal of Science to Andrew Viterbi, trustee, faculty member and namesake of the USC Viterbi School. 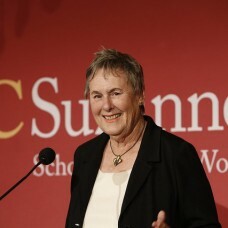 2009: USC Gould School of Law professor and associate dean Elyn Saks receives a MacArthur Foundation Fellowship. 1990: President James H. Zumberge announces that “The Campaign for USC” has raised $641.6 million and added more than a dozen new buildings. 1991: Steven B. 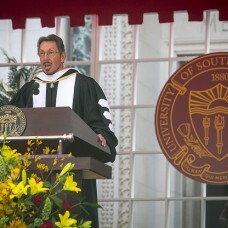 Sample becomes USC’s tenth president. 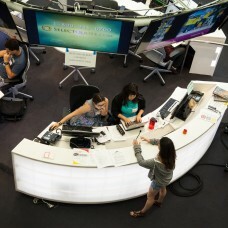 1993: Ambassador Walter H. Annenberg gives $120 million to create the USC Annenberg Center for Communication. 1993: USC launches the eight-year Baccalaureate/M.D. 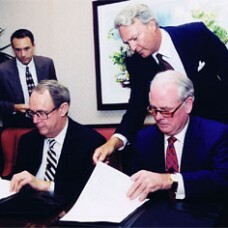 Program, a partnership between the college and the medical school. 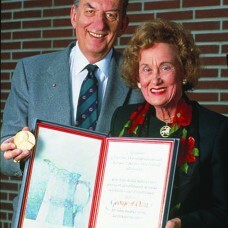 1994: USC Professor George Olah wins the Nobel Prize in chemistry. The USC Good Neighbors Campaign is inaugurated. 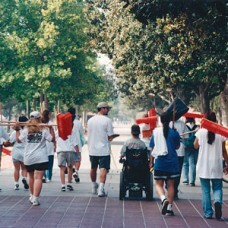 1995: USC launches Friends and Neighbors Service Day, an annual “volunteer blitz” that teams students and community residents to clean up local neighborhoods. 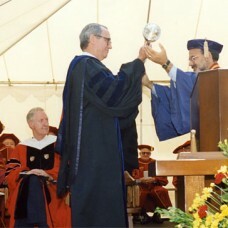 1996: The USC President’s Distinguished Lecture Series is inaugurated. 1997: For the 1997-98 academic year, USC for the first time in its history accepts fewer than half of the students who apply as new freshmen. 1998: Alfred Mann gives $112.5 million to establish the Alfred E. Mann Institute for Biomedical Engineering at USC. 1998: The schools of public administration and urban planning merge to form the USC School of Policy, Planning, and Development. 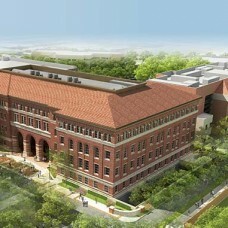 1999: In appreciation for a $110 million gift, USC's medical school is renamed the Keck School of Medicine of USC. 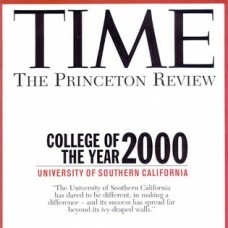 1999: Time magazine and the Princeton Review name USC “College of the Year 2000” in recognition of its outstanding community service. 1980: USC celebrates its centennial, and James H. Zumberge becomes the university’s ninth president. 1981: USC's Doheny Memorial Library celebrates the acquisition of its 2 millionth volume. 1982: USC’s pathbreaking NIBS program (Neurological, Informational and Behavioral Sciences) begins training graduate students. 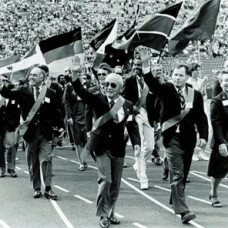 1983: Looking ahead to the summer Olympics in 1984, USC's 1983 Homecoming celebration includes "A Salute to USC Olympians." 1983: McDonald’s Olympic Swim Stadium opens on the University Park campus. 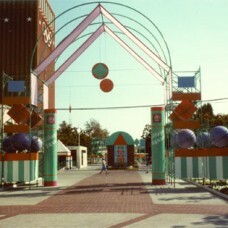 1984: The XXIIIrd Olympiad comes to Los Angeles, and University Park campus is the site of the largest Olympic Village. 1984: U.S. President Ronald Reagan visits USC before officially opening the Olympic Games. 1986: USC launches the Freshman Seminars, which address broad topics in contemporary research and scholarship. 1986: The university assumes stewardship of the historic Frank Lloyd Wright-designed Freeman House in the Hollywood Hills. 1987: With the opening of a Carl’s Jr. restaurant on campus, USC becomes the first U.S. institution of higher education to own and operate a fast-food franchise. 1989: USC becomes the first university in the world to offer a doctorate in occupational science. 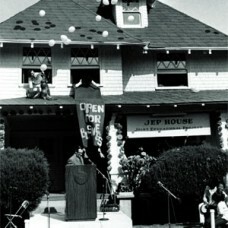 1989: The Trojans’ new bookstore debuts, with one of the largest collections of trade journals and texts in Los Angeles. 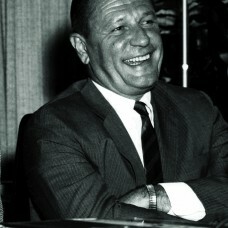 1970: Historian John R. Hubbard is elected as USC’s eighth president. President Emeritus Norman Topping is elected as USC’s second chancellor. 1970: The USC student body votes to assess itself a fee for a student-sponsored scholarship fund, which becomes known as the Norman Topping Student Aid Fund. 1971: The USC Annenberg School for Communication (renamed the USC Annenberg School for Communication and Journalism in 2009) is established. 1971: USC creates the Department of Emergency Medicine — the country’s first. 1972: The USC Joint Educational Project (JEP) — one of the oldest service-learning programs in the United States — is launched. 1972: The USC Information Sciences Institute is founded, providing key support for the development of the Internet into a national and international system. 1973: The USC Credit Union opens its doors. 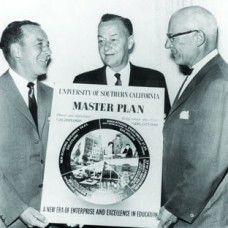 1974: The USC School of Urban and Regional Planning is founded. 1974: Dedeaux Field opens its gates, and USC’s baseball team wins its fifth straight NCAA title — to date still an unmatched record. 1974: The USC Mexican American Alumni Association is established. 1974: USC receives a National Endowment for the Humanities grant for the development of Thematic Option, the university’s innovative undergraduate honors program. 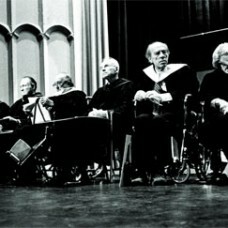 1975: The USC Davis School of Gerontology is founded, the first of its kind in the country. 1976: USC launches its “Toward Century II” fundraising campaign, which will bring in over $309 million in five years. 1976: USC’s Black Alumni Association is founded. 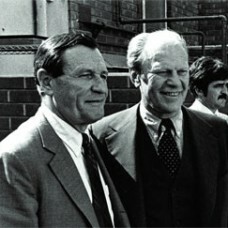 1976: Gerald R. Ford, 38th president of the United States, makes a campaign visit to USC. 1977: U.S. President Ford sends USC President Hubbard an autographed $10 bill to satisfy their wager on the Rose Bowl game in which USC defeated Michigan. 1977: USC establishes an institute dedicated to hydrocarbon research, later named the Donald P. and Katherine B. Loker Hydrocarbon Research Institute. 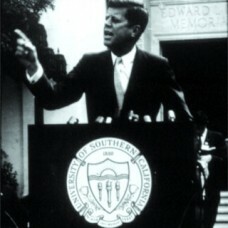 1960: Then U.S. senator John Fitzgerald Kennedy and Vice President Richard Milhous Nixon speak at USC. 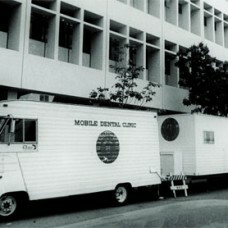 1965: The USC School of Dentistry founds its mobile dental clinic, now the oldest and most extensive self-contained facility of its kind. 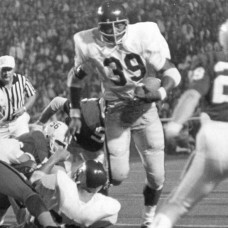 1965: Tailback Mike Garrett wins USC’s first Heisman Trophy. 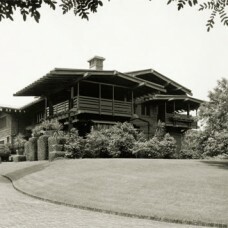 1966: The Gamble House is deeded to the City of Pasadena in a joint agreement with the USC School of Architecture. 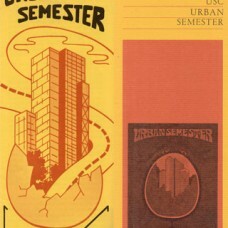 1968: USC launches “The Urban Semester,” a program that sends students out of the classroom and laboratory and into the city streets and halls of power. 1950: USC English professor and distance-learning pioneer Frank Baxter is named by Life magazine as one of America’s eight finest college professors. 1952: USC’s Health Sciences campus opens. 1952: USC launches the first doctoral program in social work in the western United States. 1952: USC’s Institute for Safety and Systems Management begins offering degree programs in safety, human factors and systems management. 1953: University Avenue (today’s Trousdale Parkway) is closed to vehicular traffic, marking a major step in creating a self-contained, pedestrian-friendly campus. 1954: For the first time, a white steed makes an appearance at a Trojan football game, with rider Art Gontier. USC’s first Songfest is held at the Greek Theater. 1955: Psychologist J.P. Guilford’s famed “Structure of Intellect” theory proposes a 3-dimensional model of intelligence instead of a single IQ score. 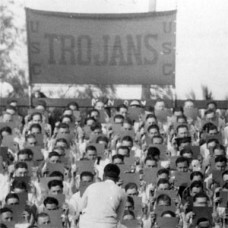 1957: USC's tradition of on-campus pre-game picnics begins. 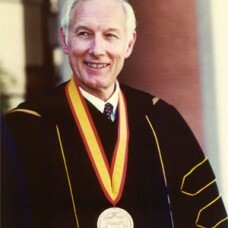 1958: Dr. Norman Topping becomes USC’s seventh president. 1959: The USC Associates, the university’s premier academic support group, is founded. 1942: USC’s Department of Occupational Therapy opens as one of the first programs of its kind in the country. 1943: In the midst of World War II, some 2,000 military trainees add to crowded conditions on campus. 1945: USC establishes biokinesiology and physical therapy departments (now merged into the Division of Biokinesiology and Physical Therapy). 1945: The USC Department of Drama is founded. 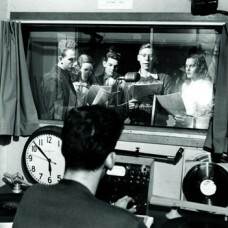 1946: KUSC goes on the air. 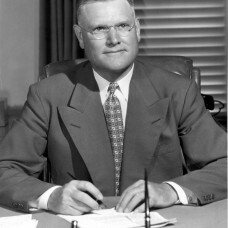 1947: Fred D. Fagg Jr. becomes USC’s sixth president. 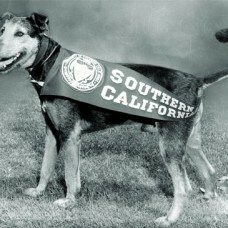 1947: A feisty stray dog, nicknamed George Tirebiter, is adopted as USC’s official student body mascot. 1947: The University Senate (reorganized as the Faculty Senate in 1973 and renamed the Academic Senate in 1992) is formed at USC. 1948: Troy Camp is founded. 1930: The Trojan Shrine is unveiled in celebration of USC’s 50th anniversary. 1930: With more than 700 foreign students (10 percent of the student body), USC ranks third in the United States in international enrollment. 1932: USC’s Edward L. Doheny Jr. Memorial Library is dedicated. 1934: USC debuts its “University of the Air,” an educational outreach program broadcast on radio. 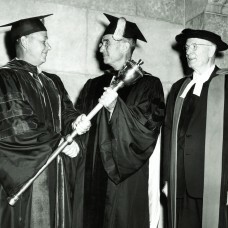 1935: President Franklin Delano Roosevelt visits the USC campus and receives an honorary doctor of laws degree. 1937: Gil Kuhn becomes the first Trojan football player to be drafted into the pros. 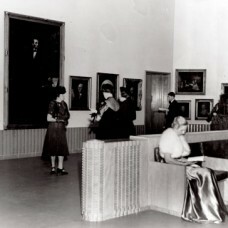 1939: USC’s Elizabeth Holmes Fisher Gallery (now called the USC Fisher Museum of Art) is dedicated. 1920: The USC School of Social Work is started by Emory Bogardus. 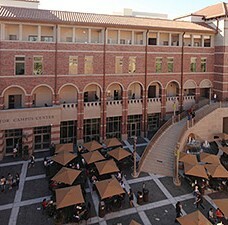 USC's College of Commerce and Business Administration opens. 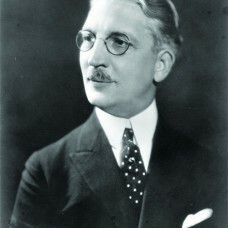 1921: Rufus B. von KleinSmid, later affectionately known as “Dr. 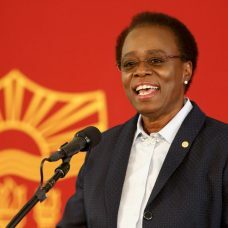 Von,” becomes USC’s fifth president. 1922: USC dental student Milo Sweet composes the music for USC’s official fight song, “Fight On,” as an entry in a Trojan Spirit contest. 1922: USC creates an extension division, offering afternoon and evening courses to the community in locations ranging from Glendale to San Diego. 1923: The first Rose Bowl game is played in the present Pasadena location, with USC winning against Penn State 14–3. 1923: The USC Trojans play in the first varsity football game ever held at Los Angeles Memorial Coliseum, beating Pomona College 23–7. 1924: USC establishes the country’s first school of international relations. The university holds its first formal observance of homecoming. 1927: USC confers its first Ph.D. to David Welty Lefever in the School of Education. 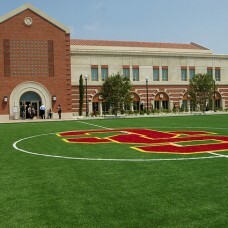 The USC College of Engineering is formed. 1929: The USC School of Public Administration opens. 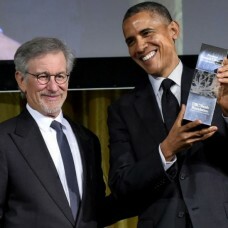 USC’s Department of Cinema — the country’s first filmmaking program — is established. 1910: USC organizes a centrally administered graduate program governed by a Graduate Council composed of senior faculty members. 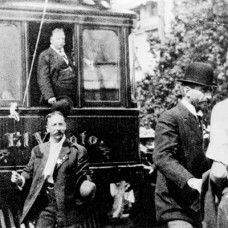 1911: President William Howard Taft visits the USC campus. 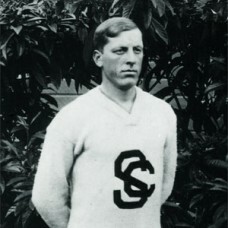 1912: Freshman Fred Kelly ’16 becomes USC’s first Olympic gold medalist. Greek letter societies are established. 1912: The USC Faculty Wives’ Club is formed (renamed the Faculty Women’s Club in 1995). 1912: The university announces a groundbreaking course in automotive science, the first of its kind in the world. 1914: A group of international students founds the USC Cosmopolitan Club to “promote friendship” among students from Asia, Latin America and Europe. 1914: The famous African-American political leader, educator and author Booker T. Washington visits the USC campus. 1915: Ten-year-old Teresa Van Grove enrolls at USC, making her the youngest Trojan. 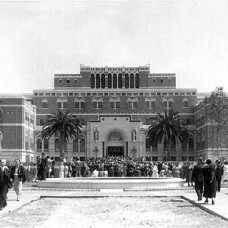 1919: USC’s Department of Architecture, the first program of its kind in Southern California, opens. 1902: USC’s second school newspaper, the Cardinal, is published. The monthly publication lives for a brief three numbers. 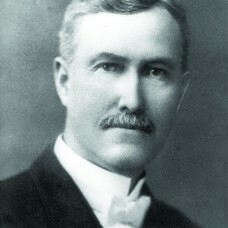 1903: George Finley Bovard (brother of Marion McKinley Bovard) becomes USC’s fourth president. 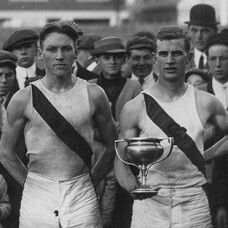 1904: USC’s first Olympic athlete, Emil Breitkreutz ’06, brings home a bronze medal for the 800 meters. 1905: The USC School of Pharmacy opens, as the first in Southern California. 1905: The Women’s Club of USC (renamed Town and Gown in 1927) is established to generate support for the university and its students. 1906: The USC Department of Physics offers coursework leading to degrees in civil and electrical engineering. 1909: USC’s Department of Education opens, to attain full school status nine years later. 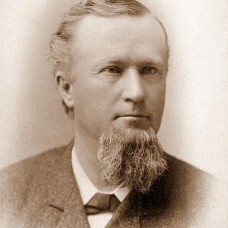 1892: Dr. Joseph P. Widney (brother of Robert Maclay Widney, and first dean of the university’s medical school) becomes USC’s second president. 1892: USC’s first student newspaper, a four-page weekly called The University Rostrum, appears. 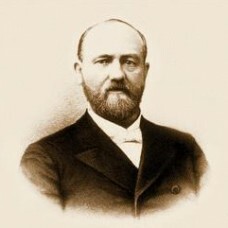 1895: Rev. George W. White becomes USC’s third president. USC adopts cardinal and gold as its official colors. 1896: USC’s law school begins when a group of apprentices form a voluntary association to study under a prominent attorney. 1897: USC begins offering courses in dentistry. 1880: Marion McKinley Bovard is named the university’s first president, concurrently serving as professor of mental and moral philosophy and natural sciences. 1880: USC formally opens, with 53 students and 10 faculty. A college of liberal arts, a university band and a debate team are established. 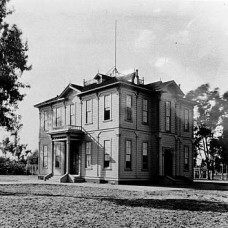 1881: USC’s first dormitory, Hodge Hall, is opened. 1884: USC’s school of music is founded. 1884: USC holds its first commencement, with a graduating class of three students; a woman, Minnie Miltimore, is named class valedictorian. 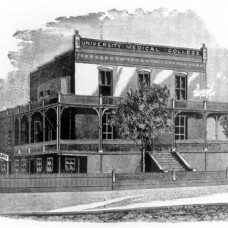 1885: USC’s College of Medicine, the first in Southern California, is established. Eight alumni form USC’s first alumni association. 1885: USC receives a gift to create its first endowed faculty position, the John R. Tansey Chair in Christian Ethics. 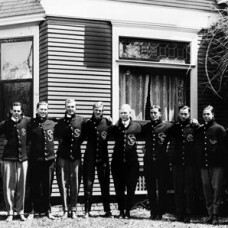 1888: USC plays its first football game and trounces the opponent 16–0. 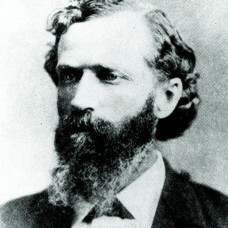 1871: Judge Robert Maclay Widney and other citizens in the frontier town of Los Angeles begin pursuing the idea of establishing an institution of higher education. 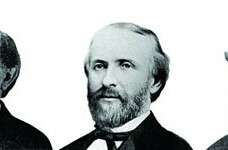 1879: Judge Widney forms a board of trustees and secures a donation of 308 lots of land from three community leaders.